OK OK, Calling in the Experts. Is this the Pointed "A" on the Variant 1 J.F. Cutter Extra? I had a comment that this was the Variant 2 "A", I have shown it to several people and I have been told its #1. Can anyone shed some light on this? Thanks DB. 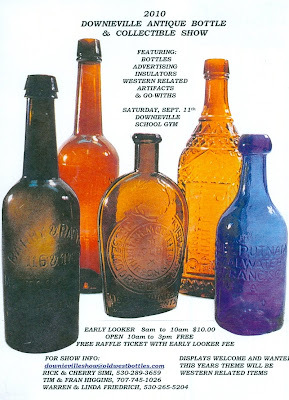 I have collected Western glass for close to 40 years, and really have an interest in Oregon bottles in addition to all historic Western glass. Awhile back, I became aware of a whiskey bottle that had recently been found during a remodel. The bottle, I was told, fell 25 feet out of a ceiling, and landed in a pile of lathe, insulation, and plaster. It bounced across the floor and like the song involving a meatball, almost rolled out the door. Being a non bottle collector, the gentleman described the bottle as a brown whiskey from Portland, Oregon, and was from A.P. Hotaling. I was hoping it was an early glob top, but concluded that it was likely a nice label only fifth, and I would be interested in looking at it. The photos came on line, and I could not believe my eyes! It was a fully labeled, Portland Hotaling "Rick Rack" glob top, and it was the RARE second version! Now my heart was really pounding, as I have never even heard of an Oregon glob fifth with a label, let alone on of the rarest open face Western whiskeys. After much back and forth discussions, we agreed to meet half way between us (7 hour drive each), and when I held this beauty, I was happy to see it beautifully whittled, and in absolutely perfect condition. Of note is the words "A.P.Hotaling, & Co." no less than 10 times on this one bottle !For an Oregon guy, this is a cornerstone piece for my collection. I have asked Mike Dolcini to draft a post surrounding Hotaling's Northwest presence, and distribution. This will hopefully follow shortly. The four boys migrated to Utah with their mother in 1852. Their father had converted to the Mormon Church in England and decided to come to Utah. The typical immigrant route for the European converts was through New Orleans and upriver to St. Louis, then by wagon train or hand cart to Utah. 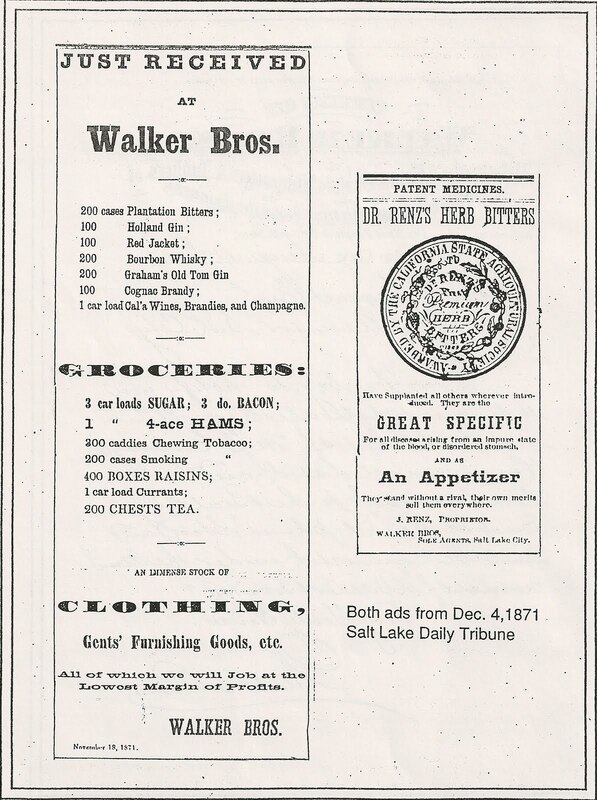 The Walker family landed in St. Louis in 1850, at the height of the Great Cholera Epidemic of 1849/50. Father and two sisters died in St. Louis, and it took the young boys 2 years of working odd jobs to earn enough to continue the trip. 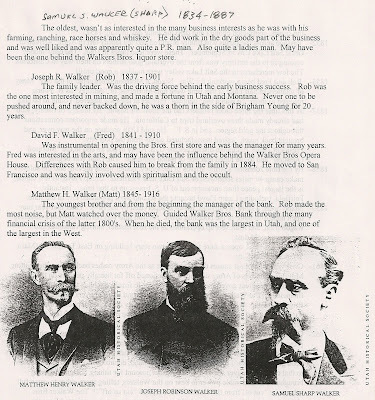 Their mother remained a member of the Mormon Church, but in the early 1860's the bros. argued with Brigham Young over several issues and left the Church. Their continued prosperity no doubt rankled B. Young, and they had very tumultuous relationship with the Church leader until his death in 1877. 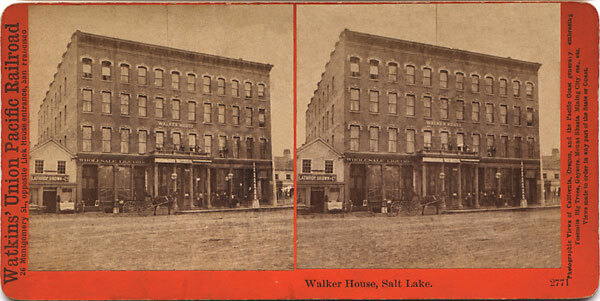 1872 photo of the Walker Bros. dry goods store and Walker Bros. bank building downtown Salt Lake City. 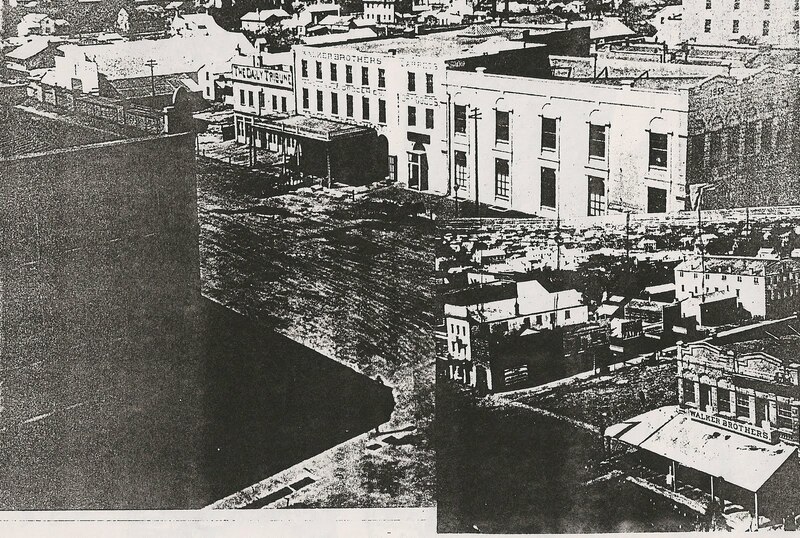 Inset photo shows store front from a different angle. 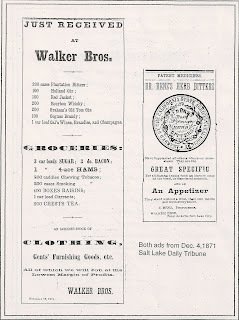 The Walkers had dry goods stores in both Fairfield, Utah and S.L.C. The town of Fairfield sprang into prominence in 1858 with the arrival of Federal troops (Johnston's Army) and the creation of Camp Floyd. Located approx. 40 miles southwest of S.L.C., Fairfield was a lively place catering to the soldier's "needs". As the Civil War approached, Camp Floyd was abandoned with the enlisted and officers returning east to fight on both sides.. Union/Confed. The "Johnson" of Johnston's Army was Gen. Albert Sidney Johnston, famous Southern commander who died in the Battle of Shiloh in April of 1862. 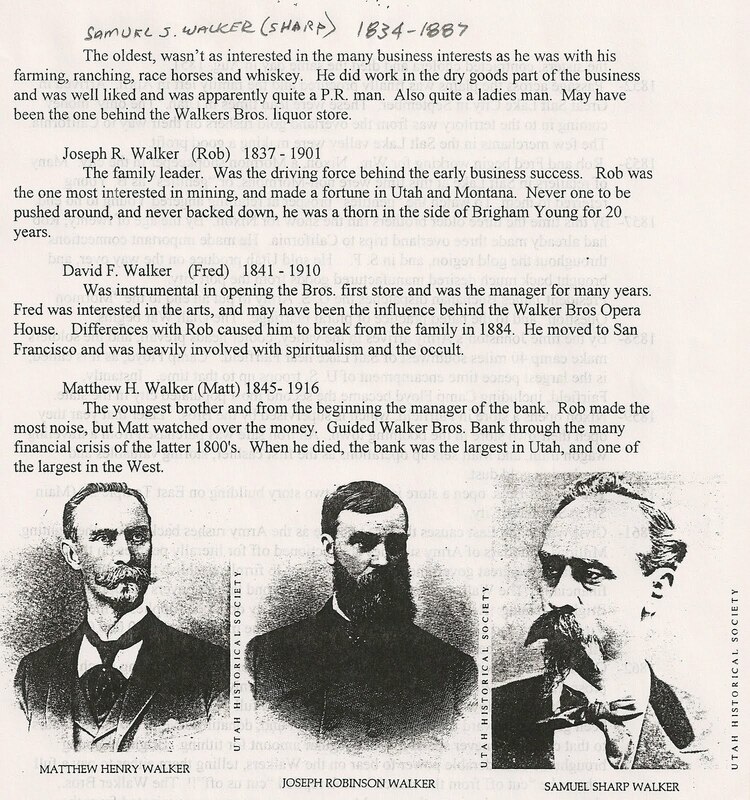 Walker Bros. bank got it's start when the brothers purchased a safe from a western bound wagon train. 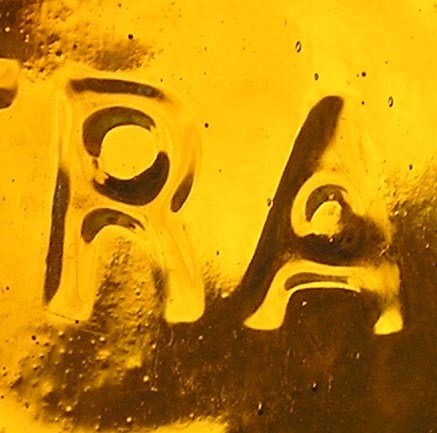 They began by storing valuables and buying and selling gold dust. Things grew from that meager beginning. 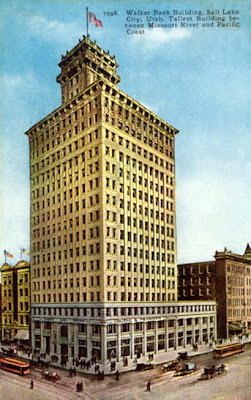 The bank merged into the First Interstate Banking group in 1981. 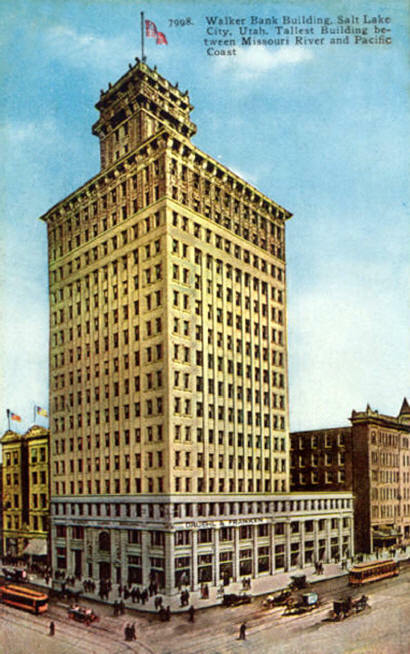 The 'new' Walker Bank Building opened Dec. of 1912. 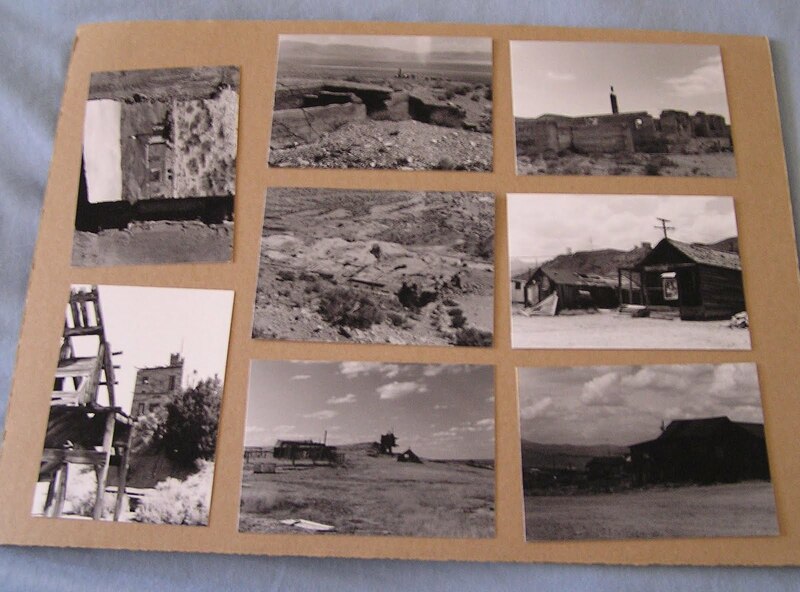 From an early post card. Tag or check from Walker's store... rumored to be from the Fairfield Store.. metal detector find. Rob Walker was a mining baron! The brothers made several million dollars in the hills of Utah. Emma mine, Price of Wales group, silver chloride deposits in the Ophir, Utah area. The big one, however, was the Alice Mine near Butte, Montana. Actually had a town there named Walkerville. What junk do we bring home!!!! Hobnail mining boots of the 1870's had numerous insignia on the sole. O.K. , U Bet, WBro.. I've seen several others including an ANo1. Stamped pick heads are collectible I guess.. This Walker Bros pick came from a small workings in the Dry Canyon District. Now my Clubhouse is not as green as the two "pure green" examples known. Mine is more of a yellow green... everything is looking more amber in this photo! as a point of reference... my Club is the one on the fencepost in Thomas's earlier book. some of you may remember that photo. Anyway, compare the Club with the two different shades of Suits fifths. The Hotaling shard is probably close to the green Clubhouses in color, so the Suits are not quite that green... not many fifths are! The S.T. Suits is known in three color shades. A) Yellow green amber - 3 mint ones known, 2 known with small issues, 1 known with repaired neck. There hasn't been that many broken ones found over the years. Probably less than 20. First ad that I have seen advertising S.T. Suits. 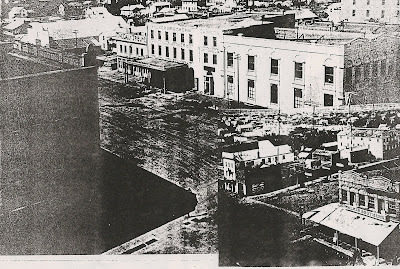 Aug of 1872. 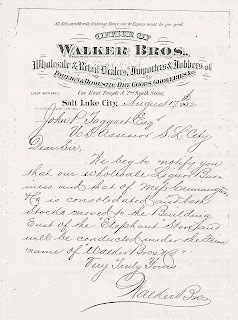 The Walker Bros. became agents for J.H. Cutter Old Bourbon Aug of 1872. 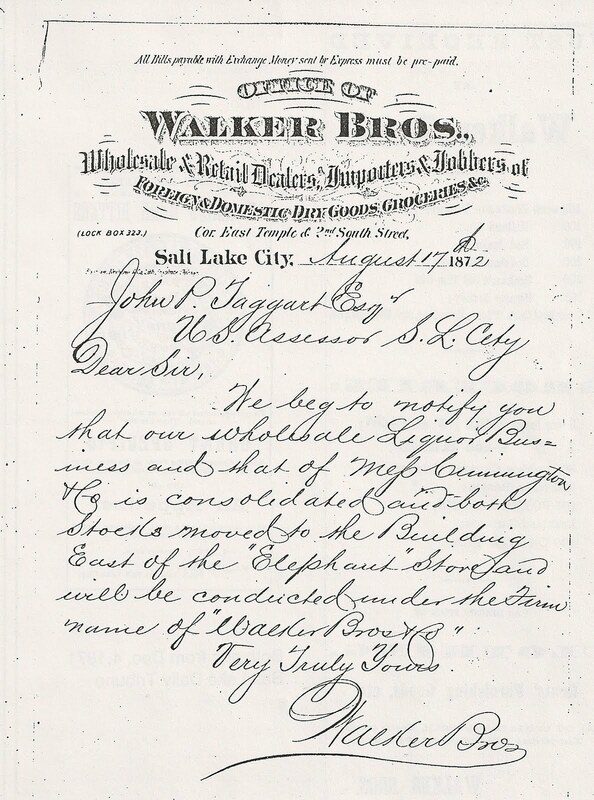 The Bros. were also agents in Utah for Jessie Moore Whiskies. J. Moore shards are scattered all across the state. Very interesting document. 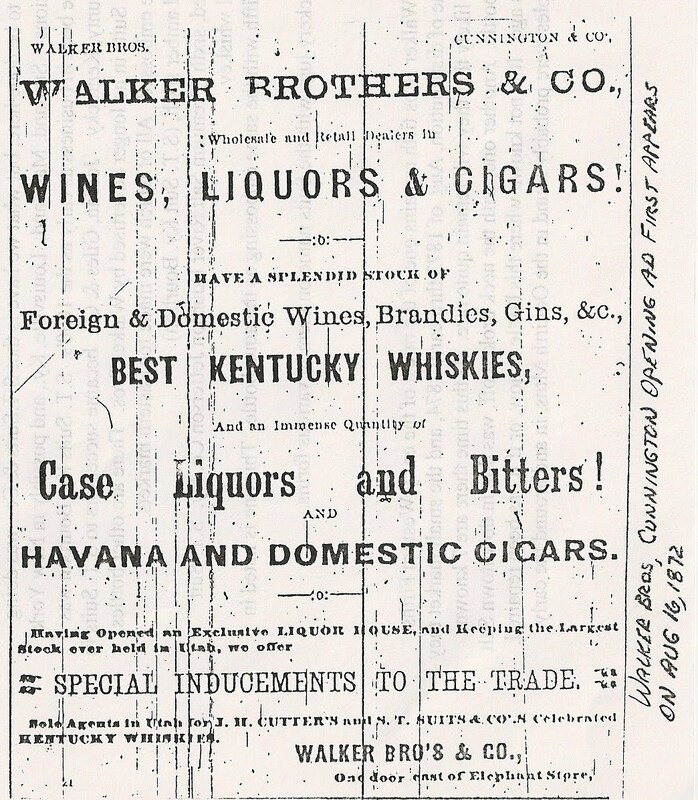 Walker's buying out or "joining forces" with Cunnington & Co. Aug. of 1872. Cunnington were the first agents for J.H. Cutter - Hotaling in Utah. 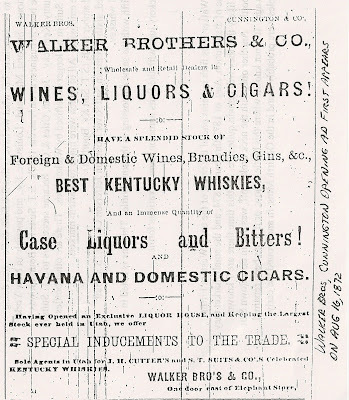 Even before the merger or the official start of the liquor house... the Bros. were selling popular products out of their dry goods store. Miner's outfitters. I have periodically featured Fleckenstein and Mayer flasks on prior posts. Here are two very rare examples from this company, which made as many different amber flasks as any Western concern. These two are both private mould specimens, and date from the early to mid 1880s. The pint is very crude and bubbly, with an unusual lip treatment. There are about six of these in collections, and an additional two with a glob top. The half pint is one that might easily be mistaken for the more commonly seen slug plate version, but upon close inspection it is indeed a private mould flask. These are very rare with about 10 in collections. They have been rumored to also come with an applied top, but I have not seen one. 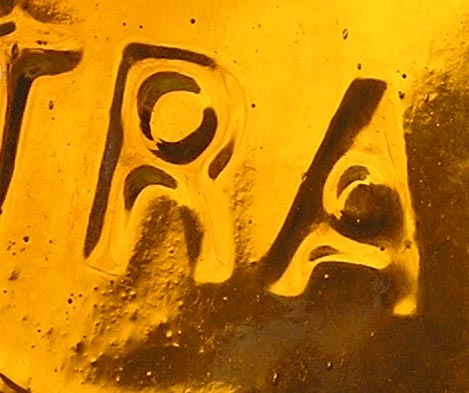 I am not aware of these particular flasks being dug anywhere but the Pacific Northwest, and not for quite some time. I do believe a few different variants have been found in California, and I would be very interested to know where. Once in awhile you come across an exceptional example of a bottle that would normally not be considered at the top of the food chain. I know that these Old Judge glob tops are about as late as an applied top whiskey can be, and are normally a pretty red coloration with nice whittle effect. This example is a real chameleon, with many different colors, ranging from yellow with a touch of green, peach, strawberry red, and a nice pucey orange...all rolled into one. The whittle effect is as good as you get in any whiskey, and the embossing has that goofy old judge holding up a glass of the stuff. As far as being just a pretty piece of glass, this qualifies. This example was dug in the Bay Area a few years ago. Not a "top 25", but the verdict is in...this one is guilty of being one killer piece of glass! My name is Jamie Bennett and I work a non-fiction television production company in New York City. We are an Emmy award-winning production company that produces programming for networks such as PBS, Discovery, History, National Geographic, A & E and many others. We’re currently seeking people who have antiques, artifacts or other valuables to appear in a television non-fiction series “Finders and Keepers” (working title) about amazing finds all over the USA. These items could either be 1) already discovered by the person, or 2) still buried and yet to be unearthed. In particular, we’re keen to hear from bottle collectors who may have unearthed valuable and unusual items on digs. I would be very appreciative if you could circulate the information below through your members, post it in your newsletters, blogs, mailing lists or bulletin boards, and suggest people we could speak to from your own circle. We would like to receive replies as soon as possible, and we’re on the lookout for as many fascinating people, items and stories as we can find! Thank you very much, I look forward to receiving some great responses! Do you think you’ve got something amazing in your attic or buried in your backyard? Whether it’s lost treasure in your garden or a family heirloom in your basement, if you suspect there’s something undiscovered, ancient and valuable on your property, we’re interested in hearing from you! Your item could either be 1) already discovered, or 2) still buried and yet to be unearthed. Our team of expert archaeologists will visit you to excavate, examine and assess your item, then give you the final word on its authenticity and value. You’ll get a chance to appear in a new television non-fiction series that will be broadcast nationwide on a major cable television network. By sharing your knowledge and passion for your item, you’ll also play a part in preserving the rich historical heritage of the USA. We’re an Emmy-award winning production company seeking people who believe they have antiques, artifacts or other valuables to appear in a television non-fiction series about amazing finds all over the USA. The series “Finders and Keepers” (working title) is being produced for a major cable network and will be filmed in fall 2010. Please visit our website http://archaeologyshow.wordpress.com/ for more information. Entering is quick and easy - click on “How To Apply” to download a short application form. We're working on a deadline and would need to receive the application form as soon as possible -- ideally next week ending Aug 20. You can also email Jamie Bennett, Development Researcher at archaeolologyshow@yahoo.com with more questions, or leave a message on our phone line 212-413-9231. I cannot recall an OPS being featured on the blog, so I thought I would post this example. 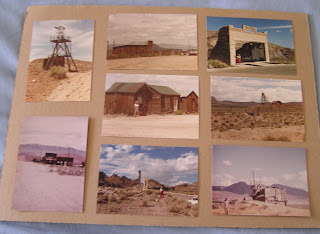 These seem to come from the California coastal areas mainly, but I have heard of them being found in Nevada. According to Thomas, there have been examples dug in Oregon as well, but I cannot confirm this. Not sure if any examples have been found in the past few years, but would be interested to know just how far these were distributed. What about Washington, or Idaho? This one was dug in Santa Cruz, by a contractor running a trencher. Apparently, this bottle was tossed out of the trench, and picked up by some kids. The late John Thomas "acquired" the OPS from them, and it was one of his favorites. I believe there are about 30 or so in collections, but they sure do not become available very often. The tooled top examples usually have very bold embossing, and as seems common, are often more crude then their glob top counterparts. This one has a very strong strike though, and has some whittle effect. Amazing it is mint given the rough start it had, being recovered in the manner it was. Paper thin glass, you almost get the feeling you could crush it in your hands, it is so fragile. Two new stars have come to light the past few weeks. The first one is seen on a pure BLACK GLASS 6th likely dating to the mid 1860s and the second one is similar to the Wideman/Chappaz star and seen here on a strawberry-puce 6th dating to the late 1860s. How common are these stars ? How many black glass 6ths/5ths have been observed ? Any input ?? ?